I was happy this morning when I saw the sun finally shined. But just when I finished making bento and wanted to take the picture, the sky went dark. Probably the baby that I made for today's bento got surprised too LOL :D I tried my best to take the picture, a bit dark though. I don't think I need to explain the ingredients that I used to make the surprised baby and his doll. Can you guess all of them? Kids will be going home at 3PM today, so here am I, sitting at the Starbucks, typing the post, and probably after this trying to find an idea for tomorrow's bento. I'm thinking about making a character from Sanrio right now. But sometimes the idea will just switch to another idea. Anyway, I wish I can have a cup of coffee with all my bento friends. Wouldn't that be great? Inside the boxes : rice, stir fry veggies (carrots, green beans, baby corns), boiled quail eggs, cucumbers, and five spice chicken. Such a cute bento! I'm guessing that rice, ketchup, nori, candy, egg sheets and/or cheese are in the little kyaraben part? ^^ You always make yours so interesting. Okay, colored rice, egg sheet, kamaboko! I will meet you at Starbucks! Can you order my tall Americano for me? yea.. wish we stay near so we can have a bento mum gathering at starbucks. Hi Lia, same answer as Sheri (sorry, Sheri for imitating your answer hahaha) and I love your use of jelly ball! Thanks a lot Yen for your kind comment as always! We should have lunch together sometimes because I always wait for the kids at SB Botanic. Near your office right? Oh... so sweet baby! By the way... another question today (am I bothering you with so many lately? ;)... is the jelly ball for the nose sweet? So many colors, love them! Yes, that would be great, I want to have a cup of coffee with you! All of those vegetables in the back look delicious. I can't wait to see what you come with next! What a detail work! I love the cute expression. I wish I can make a cute bento like you next year as my son will start bringing in bento to school! @OhayoBento : I would love too. Kids always finished their veggies but there are some veggies that are not their favorite. Thanks a lot Heather! 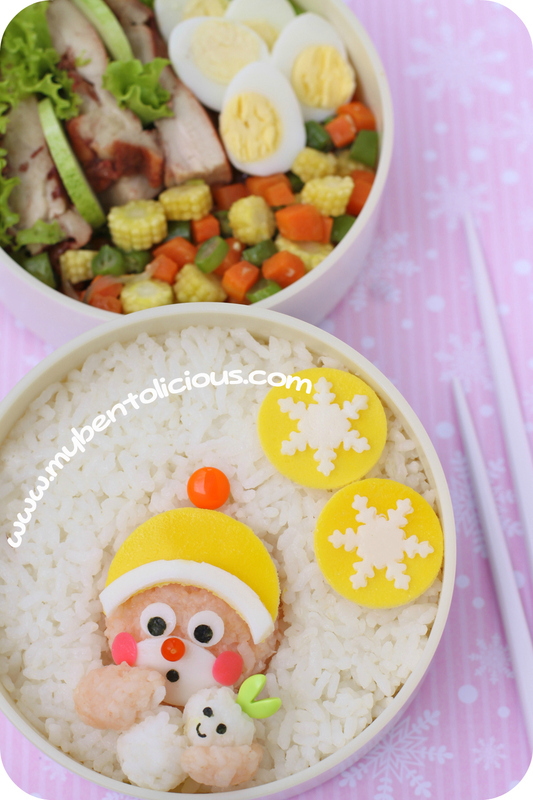 I'm sure you will find some ideas for your bento very soon, happy bento-ing! HI Lia! Hope you had a great holiday. Beautiful and super cute bento! :) The snow flakes are amazing! @Lyn : Thanks a lot Lyn! Sorry for the late reply. I have been sick, bed rest from last Sunday so didn't check my blog. Doing ok now. Hope you have a great weekend!